David and Maggie commissioned me to make a box for their friends Linda and John, who recently were married at the Monterey Bay Aquarium. The dovetails of the box are slightly proud on the corners, providing a visual and tactile effect. The inside of the lid has a carving of a Mola mola fish and their wedding date, to commemorate the event. The Mola mola fish is one of the most interesting fish in the Monterey Bay Aquarium, and is a favorite of Linda and John's. The top of the box is a raised panel that is domed in two directions. The result is the intersecting planes make an X shape on the the lid when viewed from above. We chose Swiss pear wood for its fine and delicate figure and rich color tones. 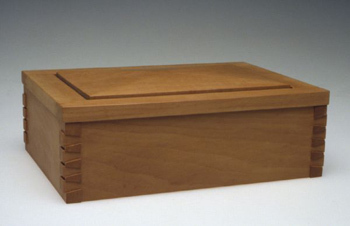 The box bottom is made of Alaskan yellow cedar to give the inside a lighter visual contrast.